Parts Books are provided in Adobe "PDF" format. In order to view or print Parts Books you must have Adobe Acrobat Reader installed. IMPORTANT: Use care when selecting model number to ensure proper part selection. Tohatsu and Nissan parts are identical with the exception of cowlings and branded fuel tanks which contain the specific brand names. 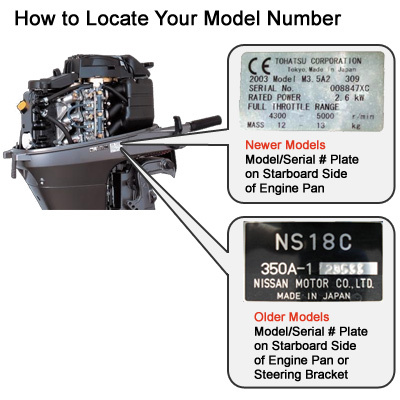 Click on image to the right to determine how to Locate Your Model Number. TIP: The last few pages of the parts books contain assembly kits and repair kits such as lower unit assemblies, powerhead assemblies, carb kits, water pump kits, gasket and seal kits, electrical kits and more. This applies to model year 1996 and newer parts books.